I have always said, if not slightly in jest, that advertisers should pay for the space they take up in my mind. More specifically outdoor advertisers, as thier messages are forced into my brain without my consent and therefor occupy a special subsection of crap that fills my thoughts. If I hum a pudding jingle that I saw on TV, it is my own fault for letting that message creep into my mind in exchange for a little sitcom induced brain shutdown. If I cant seem to get the image of a 4 story overly sexed Justin Bieber out of my mind, I have only Calvin Klien and Outfront Media to blame for that intrusion. It is with that thought that I post this NY Times article by Mathew B. Crawford. His argument, which is stated eloquently but isnt particularly new, is that we should treat our visual landscape like any other resource. We protect our air and water for the common good and the visual landscape that we share in public should be treated similarly so that the rampant abuse of that space does not cause negative economic or health issues for the population at large. I couldn't agree more. 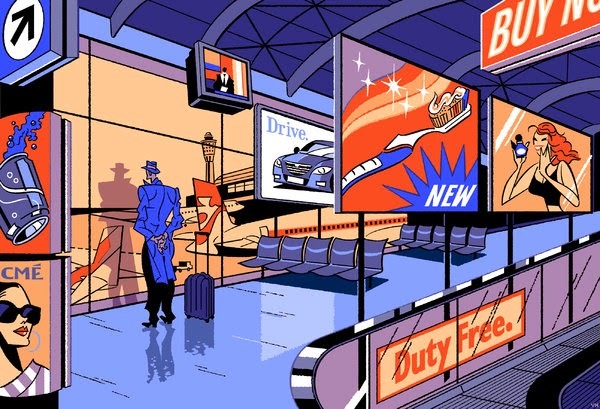 Mathew focuses his attention on an airport, which provides some nice examples of how our visual landscape is a worthwhile resource by juxtaposing the general airport with the paid lounges. If the wealthy are willing to pay for silence, or a lack of intrusion into thier visual landscape, it must have some worth. Airports though, are both public and private spaces and while I couldnt agree more that they should be treated similarly to our shared city streets when it comes to visual pollution, actual public space has a more profound reason to remain commercial free. When we allow advertising to purchase the facades of our buildings, occupy our urban infrastructure, and generally access any and all of our shared environment, we lose something more than the valuable resource of silence. What we loose is access to our city and our literal ability to shape the environment we live in by visual interaction and cultural production. If we allow advertising and commercial messaging to monetize the surface of our city, we loose access to those surfaces and with that our ability to define the cultural landscape in which we exist. To me this might be the most tragic loss due to public advertising but it surely isnt the only loss. Demanding an ad free public space is our right as citizens and of paramount importance as we continually define the objectives of our cities and the society that we want them to create.